What could be done to eliminate the digital cyst? What does the doctor by the operation of a Fingercyste? A conservativ intervention to eliminate a digital cyst is repeated needling. The mucous cyst is punctured and the cyst content is squeezed or aspirated. The pucture had to be done with a sterile needle and in a sterile setting. Three to five punctures are needed for definite resolution of the cyst. In two to three cases a cure rate can be expected. Some doctors combined the puncture of the digital mucous cyst with a cortison injection of the fingerjoint. 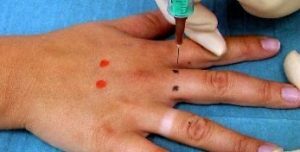 Cortisone injections can offer fast-acting relief of a painful inflamed fingerjoint. Complications are rare but may include infection of skin and joint. Can I expect that treatment corrects the nail deformity? In which cases should a mucous cyst be operated? Removal of cyst or bony spurs can usally be performed using regional anaesthesia. Which anaesthesia is in more servere cases necessary ? Some surgeons prefer a brachial plexus block in severe cases. There are many techniques for achieving a brachial plexus block. The techniques are classified by the level, at which the needle is inserted for injection of the local anaesthetic . 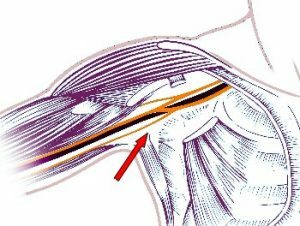 The dorctors should be patient and allow plenty of time for the brachial plexus block to develop ( about 15 – 30 minutes are necessary). In much case a simple removal of the digital cyst is not sufficient, because this simple procedure is followed by a high recurrence rate. It is better to remove the cyst and the underlying tissue connected to the joint. A more aggressive surgery remove not only the cyst but also the underlying osteophythes (smal bony spurs) and any stalk connected with the joint. For a better understanding an unusual large cyst is presented. Most digital cysts are much smaller! The digital mucous cyst is carefully dissected from the surrounding tissue. The extensor tendon below the mucous cyst is carefully spared. In a case of a larger cyst a small flap is used to cover the skin defect. In cases of reccurent cysts or larger skin defects a small skin transplant may be necessary. In concluding this informational paper I would like to encourage you to address all questions you may have in connection with a finger cyst (finger ganglion) with your attending physician as this document does not constitute a replacement to a personal examination or consultancy through your doctor.